Artist Chad Person transposes the issues of economic, political, and societal power with his commanding collages. Composed from fine fragments of cut United States currency, the collages portray military vehicles, mythological scenes, and phrases. Person manipulates the tones and patterns on each bank note to illustrate his meticulous scenes. As part of a group show at Joshua Liner Gallery called “Go East,” Person highlighted pieces from three separate series of work. The pieces are comprised from hundreds of tiny slivers of paper, cut from dollar bills. Assembled together, the pieces are affixed on canvas to create swirling textures and gradients in the monotone palette of hues of greens. In one of the artist’s most impressive pieces, iconic and recognizable number 1s from the dollar bill are transformed into the sticky suctions on the tentacles on the mythical Kraken sea monster. Its arms and and enormous head rise and writhe from waves cut from the bank notes’ light background. The monster itself is made from varying shades of dark green from the reverse side of fives, tens, and twenties. Person’s other pieces are inspired by his experience teaching university students from an air force base. Tying the notions of money and the military together, the fragments of green letters and pattern are used to create armed tanks, military planes, and other weaponry. Theses piece are a commentary on the influence of money on governmental power. The other pieces are from a third series that echo advertising and slogans. Thin lines of dollar snippets spell out “While you’re ahead,” “let go let God,” and other phrases Person has seen on billboards across the country. Person’s currency collages take a more political and socio-economical stance than other light hearted artists. His pieces prove that the artist is not afraid to put his money where his mouth is. As part of a group show at Joshua Liner Gallery called “Go East,” Person highlighted pieces from three separate series of work. 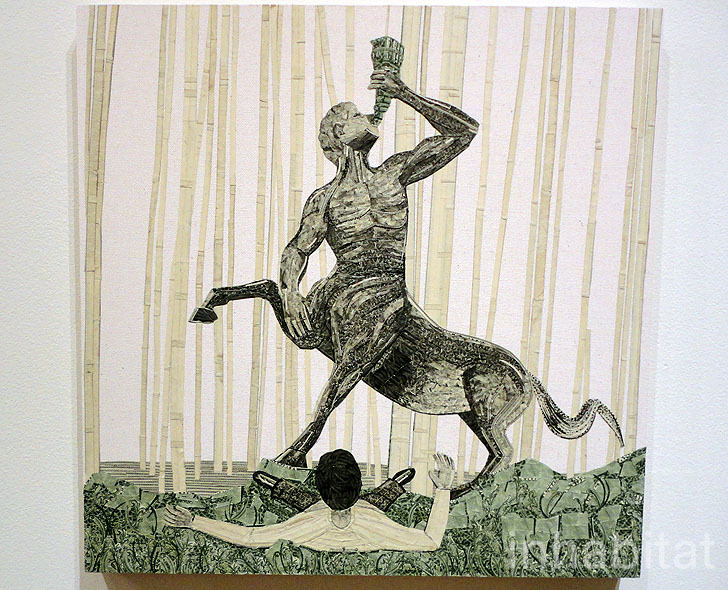 The pieces are comprised from hundreds of tiny slivers of paper, cut from dollar bills. Assembled together, the pieces are affixed on canvas to create swirling textures and gradients in the monotone palette of hues of greens. In one of the artist’s most impressive pieces, iconic and recognizable number 1s from the one dollar bill are transformed into the sticky suctions on the tentacles on the mythical Kraken sea monster. Its arms and and enormous head rise and writhe from waves cut from the bank notes’ light background. The monster itself is made from varying shades of dark green from the reverse side of fives, tens and twenties. Person’s other pieces are inspired by his experience teaching university students from an Airforce Base. Tying the notions of money and the military together, the fragments of green letters and pattern are used to create armed tanks, military planes and other weaponry. Theses piece are a commentary on the influence of money on governmental power. The other pieces are from a third series that echo advertising and slogans. Thin lines of dollar snippets spell out “While you’re ahead,” “let go let God,” and other phrases Person has seen on billboards across the country. Person’s currency collages take a more political and socio-economical stance than other light hearted artists. His pieces prove that the artist is not afraid to put his money where his mouth is.